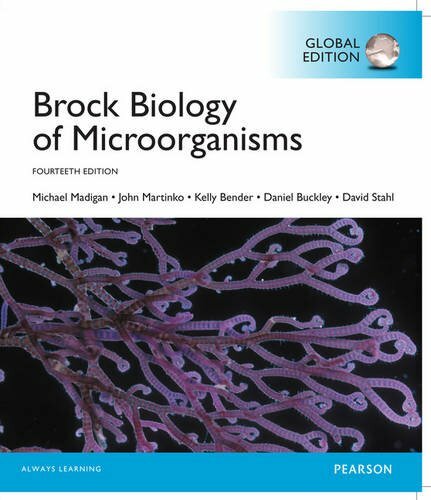 Obtenez le livre Brock Biology of Microorganisms, Global Edition par Michael T. Madigan, John M. Martinko, Kelly S. Bender, Daniel H. Buckley, David A. Stahl au format PDF ou EPUB. Vous pouvez lire des livres en ligne ou les enregistrer sur vos appareils. Tous les livres sont disponibles au téléchargement sans avoir à dépenser de l'argent. The Fourteenth Edition seamlessly integrates the most current science, paying particular attention to molecular biology and how the genomic revolution has changed and is changing the field. This edition offers a streamlined, modern organization with a consistent level of detail and updated, visually compelling art program. Brock Biology of Microorganisms includes MasteringMicrobiology®, an online homework, tutorial, and assessment product designed to improve results by helping students quickly master concepts both in and outside the classroom. Note: You are purchasing a standalone product; MasteringMicrobiology does not come packaged with this content. MasteringMicrobiology is not a self-paced technology and should only be purchased when required by an instructor. Michael T. Madigan received his B.S. in Biology and Education from Wisconsin State University–Stevens Point (1971) and his M.S. (1974) and Ph.D. (1976) in Bacteriology from the University of Wisconsin–Madison. His graduate research was on the hot spring bacterium Chloroflexus in the laboratory of Thomas Brock. Following a three-year postdoctoral at Indiana University, Mike moved to Southern Illinois University–Carbondale, where he taught introductory microbiology and bacterial diversity as a professor of microbiology for 33 years. In 1988 Mike was selected as the Outstanding Teacher in the College of Science and in 1993, the Outstanding Researcher. In 2001 he received the SIUC Outstanding Scholar Award. In 2003 he received the Carski Award for Distinguished Undergraduate Teaching from the American Society for Microbiology, and he is an elected Fellow of the American Academy of Microbiology. Mike’s research is focused on bacteria that inhabit extreme environments, and for the past 15 years he has studied Antarctic microbiology. In addition to research papers, he has edited a major treatise on phototrophic bacteria and served for 10 years as chief editor of the journal Archives of Microbiology. He currently serves on the editorial board of the journals Environmental Microbiology and Antonie van Leeuwenhoek. Mike’s nonscientific interests include forestry, reading, and caring for his dogs and horses. He lives on a quiet lake with his wife, Nancy, four shelter dogs (Gaino, Pepto, Peanut, and Merry), and three horses (Eddie, Gwen, and Festus). John M. Martinko received his B.S. in Biology from The Cleveland State University. He then worked at Case Western Reserve University, conducting research on the serology and epidemiology of Streptococcus pyogenes. His doctoral work at the State University of New York at Buffalo investigated antibody specificity and antibody idiotypes. As a postdoctoral fellow, he worked at Albert Einstein College of Medicine in New York on the structure of major histocompatibility complex proteins. Since 1981, he has been in the Department of Microbiology at Southern Illinois University Carbondale where he was Associate Professor and Chair, and Director of the Molecular Biology, Microbiology, and Biochemistry Graduate Program. His research interests centered on the structure- function relationships of immune system proteins, including immunoglobulins, T cell receptors, and major histocompatibility proteins. His teaching interests include an advanced course in immunology as well as immunology and inflammation instruction to medical students. For his educational efforts, he won the 2007 Southern Illinois University Outstanding Teaching Award. He has been active in a number of educational outreach programs for pre-university students and teachers. He has also been a faculty member at Bard College in their innovative Citizen Science program, an interactive laboratory, computer and problem-based-learning science curriculum that introduces freshmen students to critical thinking through the discovery and application of scientific principles. He was the Chair of the Institutional Animal Care and Use Committee at SIUC and continues to act as a consultant in the area of animal care. He is also an avid golfer and cyclist. John lives in Carbondale with his wife Judy, a high school science teacher. Kelly S. Bender received her B.S. in Biology from Southeast Missouri State University (1999) and her Ph.D. (2003) in Molecular Biology, Microbiology, and Biochemistry from Southern Illinois University–Carbondale. Her dissertation work focused on the genetics of perchlorate-reducing bacteria. During her post-doctoral fellowship, Kelly worked on the genetic regulation of sulfate-reducing bacteria in the laboratory of Judy Wall at the University of Missouri–Columbia. She also completed a transatlantic biotechnology fellowship at Uppsala University in Sweden researching regulatory small RNAs in bacteria. In 2006, Kelly returned to her alma mater, Southern Illinois University–Carbondale, as an Assistant Professor in the Department of Microbiology and was tenured and promoted to Associate Professor in 2012. Her lab studies a range of topics including the regulation of stress responses by small RNAs, microbial community dynamics of sites impacted by acid mine drainage, and the bioremediation of uranium by metal- and sulfate-reducing bacteria. Kelly teaches courses in microbial genetics and molecular biology, has served on numerous federal grant review panels, and is an active member of the American Society for Microbiology. Her other interests include biking, cooking, and spending time with family, friends, and her miniature schnauzer, Pepper. Daniel H. Buckley is an Associate Professor at Cornell University in the Department of Crop and Soil Sciences. He earned his B.S. in Microbiology (1994) at the University of Rochester and his Ph.D. in Microbiology (2000) at Michigan State University. His graduate research focused on the ecology of soil microbial communities and was conducted in the laboratory of Thomas M. Schmidt in affiliation with the Center for Microbial Ecology. Dan's postdoctoral research examined linkages between microbial diversity and biogeochemistry in marine microbial mats and stromatolites and was conducted in the laboratory of Pieter T. Visscher at the University of Connecticut. Dan joined the Cornell faculty in 2003. His research program investigates the ecology and evolution of microbial communities in soils with a focus on the causes and consequences of microbial diversity. He has taught both introductory and advanced courses in microbiology, microbial diversity, and microbial genomics. He received a National Science Foundation Faculty Early Career Development (CAREER) award in 2005 for excellence in integrating research and education. He has served as Director of the Graduate Field of Soil and Crop Sciences at Cornell and Co-Director of the Marine Biological Laboratory Microbial Diversity Summer course in Woods Hole, Massachusetts. He currently serves on the editorial boards of Applied and Environmental Microbiology and Environmental Microbiology. Dan lives in Ithaca, New York with his wife Merry and sons Finn and Colin. Dan enjoys running and a variety of outdoor sports but, most of all, catching critters down at the creek with his boys. David A. Stahl received his B.S. degree in Microbiology from the University of Washington, Seattle, and completed graduate studies in microbial phylogeny and evolution with Carl Woese in the Department of Microbiology at the University of Illinois, Champaign-Urbana. Subsequent work as a postdoctoral fellow and research associate with Norman Pace, then at the National Jewish Hospital in Colorado, involved early applications of 16S rRNA-based sequence analysis to the study of natural microbial communities. In 1984 Dave joined the faculty at the University of Illinois with appointments in Veterinary Medicine, Microbiology, and Civil Engineering. In 1994 he moved to the Department of Civil Engineering at Northwestern University, and in 2000 returned to the University of Washington as professor in the Departments of Civil and Environmental Engineering and Microbiology. Dave is known for his work in microbial evolution, ecology, and systematics, and received the 1999 Bergey Award and the 2006 ASM Procter & Gamble Award in Applied and Environmental Microbiology. He is a fellow in the American Academy of Microbiology and a member of the National Academy of Engineering. His main research interests surround the biogeochemistry of nitrogen and sulfur and the microbial communities that sustain the associated nutrient cycles. His laboratory was first to culture ammonia-oxidizing Archaea, a group believed to be the key mediators of this process in the nitrogen cycle. Dave has taught several courses in environmental microbiology, was one of the co-founding editors of the journal Environmental Microbiology, and has served on many advisory committees. Outside the lab, Dave enjoys hiking, bicycling, spending time with family, reading a good science fiction book, and¯with his wife Lin¯renovating an old farmhouse on Bainbridge Island.